UPDATED: Tue., Oct. 16, 2018, 9:51 a.m.
Democrat Lisa Brown emerged on top of the latest money contest for Eastern Washington’s seat in Congress, besting Rep. Cathy McMorris Rodgers in a race that is now pushing $10 million. Brown reported more than $2.2 million in contributions during two months of feverish campaigning following the August primary, according to filings Monday with the Federal Election Commission. McMorris Rodgers reported raising $1.42 million over the same period strictly for her re-election campaign, with an additional $500,000 for other candidates and committees. All that money has earned the race national attention. The campaigns have disputed fundraising totals in the past, with the Brown campaign arguing that transfers out of a joint fundraising committee established by the congresswoman shouldn’t be included in the totals because it’s unclear when those donations were made. Donations beyond individual limits on donations directly to campaigns go to that joint fundraising account, the McMorris Rodgers campaign contends, and should be counted as donations to her re-election bid. In total, the candidates report contributions north of $9.7 million, which already makes the race the most expensive in McMorris Rodgers’ career, and likely the costliest ever for Eastern Washington’s seat. Brown’s total of $4.6 million is three times more than any Democrat has raised against the congresswoman. The 1994 contest between Rep. Tom Foley, then speaker of the House, and Republican George Nethercutt, who bested Foley in a midterm shocker, saw the candidates raise about $3.1 million, with Foley earning twice his challenger’s total. That amount would be $5.2 million in today’s dollars, a little more than half of what has been raised in the McMorris Rodgers/Brown contest. “Our people-powered fundraising success demonstrates that after 14 years, Eastern Washington is ready for an independent advocate who will put our region’s interests over special interests and party priorities,” Brown said in a statement announcing the fundraising totals. The candidates have put that money to use, as evidenced by the flood of television and direct mail advertising in the race. Brown reported spending $1.4 million on TV ads during the period, with McMorris Rodgers spending $882,000. Both campaigns also spent money on their own polling data in the weeks ahead of the November election. 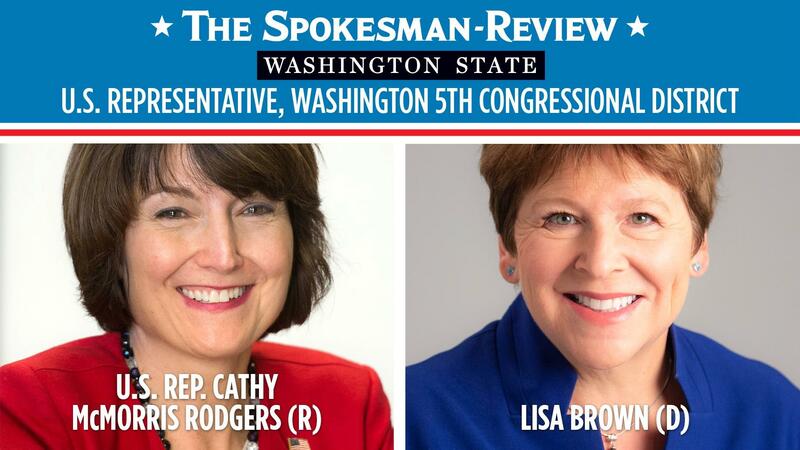 McMorris Rodgers won 49 percent of the vote in the primary, with Brown taking 45 percent. “This election is about a choice. A choice between my record and vision and my opponent’s,” said McMorris Rodgers in her own statement announcing the fundraising totals. The airwaves have been dominated since July by advertisements from both candidates that have included harsh rebukes of the other’s legislative record. But unlike other contentious races throughout the country, the advertisements have been largely funded by the candidates themselves, even as accusations fly about the role of so-called “dark money” that is working its way into the contest. Outside groups have spent $104,325 on the Eastern Washington campaign, according to the website Open Secrets run by the political spending watchdog Center for Responsive Politics. That figure pales in comparison to the $30.7 million spent in Georgia’s 6th Congressional District last year, where GOP Rep. Karen Handel won a special election largely seen as an early referendum on the Donald Trump White House. It’s also far less than the $9 million outside groups have spent in Washington state on the 8th District race between Kim Schrier and Dino Rossi, an open seat east of Seattle that Democrats hope to flip to their side in November. Travis Ridout, an associate professor of political science at Washington State University who studies political advertising and campaign finance, said it’s rare for a challenger to raise more money than the incumbent during any period of a campaign. It’s also uncommon for an opponent to spend more on advertising, as the reports indicate Brown did at the end of the summer. Ridout said that might be an indication Brown is pushing back on the McMorris Rodgers ads that have criticized the Democrat as a tax-and-spend liberal. “You want the viewing audience to hear more of your message than the opponent’s message,” Ridout said. Brown’s campaign highlighted that her total did not include donations from committees representing corporate interests. Brown did accept donations from groups representing labor interests, teachers and public employees. The largest source of her campaign cash came from a joint fundraising committee of her own, Flip WA Blue 2018, which is based in Seattle and collects contributions in support of Brown, Schrier, 3rd District candidate Carolyn Long and the Democratic Party in Washington state. Among the national Democrats who gave to Brown’s campaign are Rep. John Lewis, the civil rights leader from Georgia; Rep. Adam Schiff, the top-ranking Democrat on the House Intelligence Committee who has been critical of his colleague, Rep. Devin Nunes, and President Donald Trump; and Rep. Pramila Jayapal, the Seattle Democrat who is all but assured a return to Congress in a safe, progressive district. Local lawmakers who gave to Brown include City Councilman Breean Beggs and City Councilwoman Karen Stratton. Mike Ormsby, who was appointed U.S. attorney for Eastern Washington under President Barack Obama, also gave to Brown’s campaign, as did state Rep. Marcus Riccelli, Brown’s former policy adviser in Olympia. The McMorris Rodgers campaign said that of the individuals contributing directly to her re-election campaign, 92 percent live in Washington, a pushback on claims that her support comes from outside the district. But national Republicans also provided financial support during the quarter, including a $2,000 check from Trump’s national campaign committee, even as McMorris Rodgers has hosted several of the president’s political surrogates in the weeks before the election. Monday’s numbers do not include contributions collected during a stump speech by Vice President Mike Pence, a $250-a-plate luncheon that was attended by nearly 1,000 people. The cut-off date for reporting was Sept. 30, and the event took place Oct. 2. The appearance was a joint fundraiser for McMorris Rodgers, the Republican Party and Pence’s political action committee. Other donations came from the official candidate committees for McMorris Rodgers’ colleagues in House leadership, including Reps. Kevin McCarthy of California and Steve Scalise of Louisiana. Political action committees representing interests at Amazon, Comcast, Coca-Cola and Union Pacific Railroad were also among those who gave to the congresswoman. McMorris Rodgers’ joint fundraising committee has transferred nearly $700,000 to her official candidate committee in this election, part of a total of $5.1 million she’s reported raising. The state Republican Party also donated $5,000 to McMorris Rodgers at the end of September, a sign that the party statewide has identified the seat as one worth protecting. Local supporters of McMorris Rodgers include Steve Corker, former city councilman and ex-chairman of the Spokane County Democrats; Spokane Valley City Councilman Arne Woodard; developer Walt Worthy; and former state Rep. John Ahern. Former Republican Sen. Slade Gorton also gave to McMorris Rodgers, as did Rob McKenna, the former GOP attorney general for the state of Washington. Monday’s filing was the last due before the midterm election Nov. 6. Ballots are scheduled to be mailed out this week, and the candidates are slated for a pair of debates in Spokane on Wednesday and Thursday. Published: Oct. 16, 2018, midnight Updated: Oct. 16, 2018, 9:51 a.m.